Ahhhhhh, Fall! For most of us runners, Fall = running season. Cooler mornings, a race every single weekend until Christmas, and the threat of holiday weight gain urging us to employ our running shoes more frequently. For many runners, it also means having our sights set on the finish line at some marathon or another. 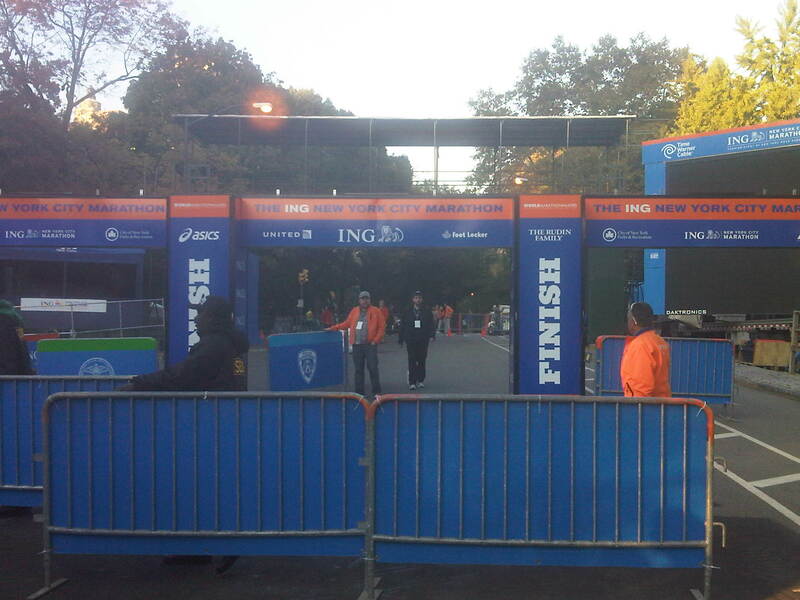 NYC Marathon Finish Line. Mecca, for a lot of us. 16 weeks of training (or more), weekend after weekend of long runs, the shame of having to wear compression socks to the grocery store on Saturday afternoons, and more attention to our glutes than most of us like to admit culminates with 26.2 miles of foot-stomping fun. Sometimes a runner’s dream is dashed only weeks before the Big Race. Tendonitis, pulled muscles, stress fractures, catch-all joint syndromes, and mystery pains can keep the most seasoned marathoner from toeing the line this Fall. The dreaded DNF. DNF usually stands for Did Not Finish. I hate this acronym. There’s an innate sense of failure in the wording that brings about feelings of deep shame to the individual whose name bears these three little letters on the runner roster. But DNF doesn’t tell the whole story, nor is it the final chapter in your running book. It takes courage to defer or call it a day. When you know your body can’t take any more, that running further or for more weeks would only be detrimental to your long term health, DNF-ing or deferring is SMART. In fact, it takes a smarter, more seasoned runner who knows their limits to call it a day. The smart runner knows when it’s over. The smart runner knows that one race does not define them. The smart runner knows there will be more. The smart runner knows when to ask for help. The smart runner knows the difference between good pain and bad pain. The smart runner pushes the limits and is ok when, occasionally, they fail. The stupid ones (yes, I called you stupid) push through the bad pain and force themselves on the course simply for their own ego. You know where ego gets you? The orthopedic surgeon’s office and then the PT’s clinic for months and months in excruciating pain. Sounds fun, right? To all of you who have called it a season, despite having paid for a marathon entry this Fall, I salute you. You are smart and brave and I applaud you for taking care of yourself, knowing there will be other races for you to rock. Have you ever deferred or had to DNF? How did you feel then? How do you feel now? Are you considering a deferment this year? Share with us! After a cross country move and taking a break from work to settle my child into our new life, I put effort into taking care of myself and getting myself back into shape – getting strong. I’ve spent the last 6 or so weeks doing so and it pains me (literally) to say that after a measly 5K race 2 weeks ago, I’m feeling back pain again!! I’m trying to be smart with my fitness but I’m frustrated! I like to run but don’t love it but find when I CAN’T, I’m determined to do so even more. I’m working hard (and smart) to heal this injury and strengthen myself but wow, am I ticked off. Then I remember all that you have endured and know this is a drop in the bucket. That’s so frustrating. Have you tried PT? I DNF’d this summer and wrote about it here:(http://cotrailrunnernc.blogspot.com/2012/07/i-did-not-finish.html). As a follow-up, I did sign up for the Umstead 100 last week, and will be trying again this spring… so I guess the story is to be continued… I still don’t regret calling it a day, but I’m also still disappointed that it came to that. You’re gonna kill this 100 miler! I’m about to DNF the Chicago Marathon in a few weeks. It’s been a tough year, health-wise. I had pneumonia in April (which took literally 2 months to recover from), then got strep throat the first week of marathon training. I wasn’t really back to per-pneumonia form until early July. Then the first week of August I had my appendix out. I took 3 weeks off (per dr orders), but even when I was “back”, I wasn’t myself. I had one “good” month of training this whole summer! I ran a half marathon last weekend and it was the hardest 2+ hours of my life (but I got that medal, damnit!). It was my sign that my body is just not ready to do what it needs to right now. This weekend is my 20 miler and I’m still struggling with whether or not to just get out there and see how far I can go or just call it a training season. But like you said, is it really worth a possible injury?! Or in my case, running depression if I cant finish or finish with a miserably slow pace? This post is just what I needed. Honestly. My ego is telling me I should toe the start line in October and push it and do whatever I can. I can’t decide if my pain or whatever is in my head or real, which is why I’m struggling so much with this! Gotta be a smart cookie and check your ego at the door. Our body has been thru a lot & pushing it “just to see” really isn’t worth potential injury, is it? Thank you for writing this post, seriously, thank you. I will be deferring my NYCM entry (through TFK) this year because I got a stress fracture last week, which will keep me from running for the next 4-6 weeks. Many people have told me to not “give up hope,” but it’s not that I’m giving up hope of EVER running a marathon, I just don’t think this is the right time. I COULD attempt to re-train in 4-3weeks after this boot is off, but then I’d likely just risk re-injury. I have been the stupid runner too many times, I would like to start being the smart one. The smart runner who’s not stuck on the couch (or bike in my case 🙂 ). So smart, lady! Stress fractures are not to be messed with. Is it a DNF if you don’t start the race? I had to cancel my plans of running the LA Marathon, Pasadena RnR Half Marathon, and Rose Bowl Half Marathon back in Jan/Feb/March due to a tibial stress fracture. It was heart breaking for me because I had been running so well (or so I thought). I was on pace to run a big PR at LA, and it crushed me because I know that it will be a while before I’m back at that level of fitness. Between my injury and job, there was just no way to maintain the fitness. I’m running MCM next month, but I’m taking it slow and just going to finish. I’ve had recurring shin splints since the stress fracture, and while I thought about deferring to next year, I think if I continue to listen to my body and take it slow (not be afraid to walk), I’ll be fine. Finishing the marathon will be a big deal after the year I’ve had. Finishing feeling good is always my goal and a total WIN! Take your time getting back into it. Stress fractures are a big deal & tough to heal. Im about to defer the NYC marathon. I was diagnosed with chondromalacia patella. It was heartbreaking. I’ve waited 3 years to run this marathon. I haven’t run in 4 weeks and the future doesn’t look to bright. I start PT next week. I hope this helps. Im getting desperate. Anyone else out there have/had this problem? Specifically? No. But I feel your pain, girl. You’re so smart to hit up the PT and get stronger. The marathon will be there for you next year. I agree wholeheartedly. I’m not a fan of people who sign up for a big event, talk a good game but don’t put the work in, then bow out… BUT… injury, illness, and other issues are perfectly legitimate reasons to DNF or DNS.